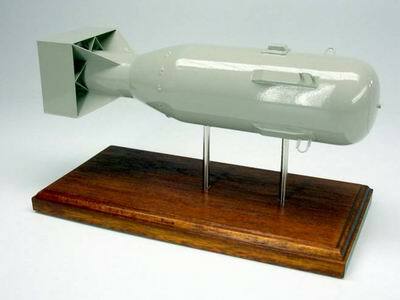 Little Boy was the first nuclear weapon used in warfare. It exploded approximately 1,800 feet over Hiroshima, Japan, on the morning of August 6, 1945, with a force equal to 13,000 tons of TNT. Immediate deaths were between 70,000 to 130,000. Little Boy was dropped from a B-29 bomber piloted by U.S. Army Air Force Col. Paul W. Tibbets. Tibbets had named the plane Enola Gay after his mother the night before the atomic attack. Mahogany Wood. Scale: 1/10. Length 13 inches.